Toshiba's transition from planar NAND flash to 3D NAND flash memory has been a long, drawn-out process. Their BiCS 3D NAND architecture is on its third generation but has yet to have any significant impact on the SSD market. The first generation of BiCS 3D NAND was never mass produced. The second generation 256Gb 48-layer BiCS2 3D NAND has seen some use in memory cards and smartphones, but its only presence in the SSD market has been the BG series—a relatively low-volume OEM-only line of BGA SSDs. It's enough to prove that their 3D NAND isn't vaporware, but hasn't done anything to alleviate the ongoing global NAND shortage or push prices down. Toshiba's third generation 3D NAND is planned to be the one that finally displaces planar NAND, with a 512Gb 64-layer TLC part that should be able to beat the price/GB of Toshiba's 15nm planar TLC, and a smaller 256Gb part for lower-capacity applications like memory cards. This week Toshiba is publicly demonstrating for the first time a SSD using their 64-layer BiCS3 3D NAND. 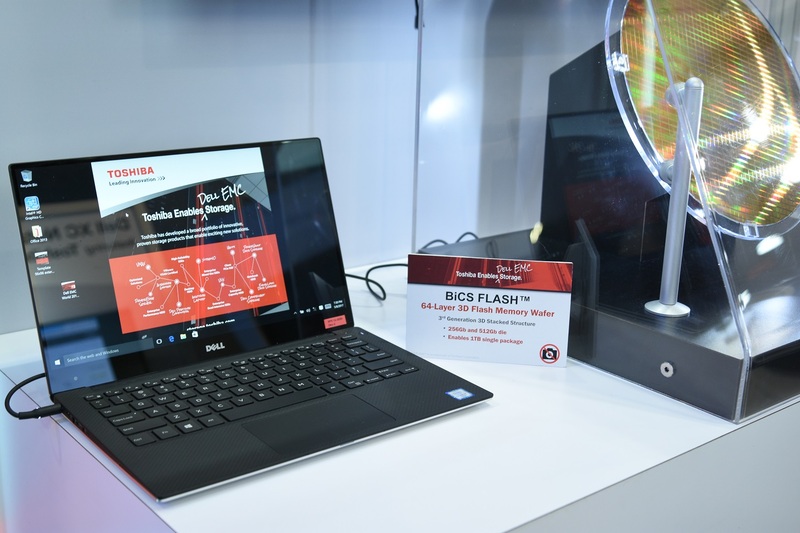 At the Dell EMC World conference, Toshiba has a live demo of a laptop containing a prototype XG-series NVMe PCIe SSD with a total of 1TB of BiCS3 3D TLC NAND. Toshiba's XG3 series is the OEM counterpart to the OCZ RD400 consumer NVMe drives. Toshiba won't comment on how the XG prototype differs from the RD400 or XG3 aside from using 3D NAND, but the prototype probably offers an early look at what the next XG will feature when it is ready to be officially announced. The prototype is a model that is currently sampling to large OEMs and could be formally announced in just a few months. Toshiba has announced that they intend to migrate all of their SSD product lines to their 3D TLC NAND, starting with OEM and enterprise products before rolling out to the retail market. They are not willing to commit to a particular timeline for completing the transition, but we should see multiple models announced and shipping by the end of 2017. Supply will continue to be a concern as new 3D NAND fab capacity comes online in 2018, and that's when we might see the current flash memory shortage wrap up and SSD prices resume a healthy decline.